A young bear from the jungles of Peru with a passion for all things British travels to London in search of a home. Finding himself lost and alone at Paddington Station, he begins to realize that city life is not all he had imagined - until he meets the kindly Brown family, who read the label around his neck ('Please look after this bear. Thank you'). They name him after the station and offer him a temporary home, where he discovers that his favorite food is marmalade. However, when Paddington gets into mischief, Mr. Brown is not at all impressed and decides the little bear is no longer welcome to stay. 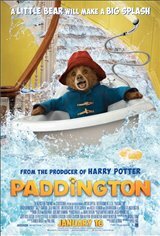 But that's not the worst of Paddington's troubles. A taxidermist (Nicole Kidman) spots the bear and decides to stuff him.